Hello, my name is Belin Fieldson, I’m a software developer who builds VR, AR and mixed reality applications. You can find my current personal fulldome project on www.cosmicorbiters.com. Download it today if you have a dome, it’s a fun game for your attendees to play with their smart phones. Today we’re going to learn to build a fulldome flight simulator game. 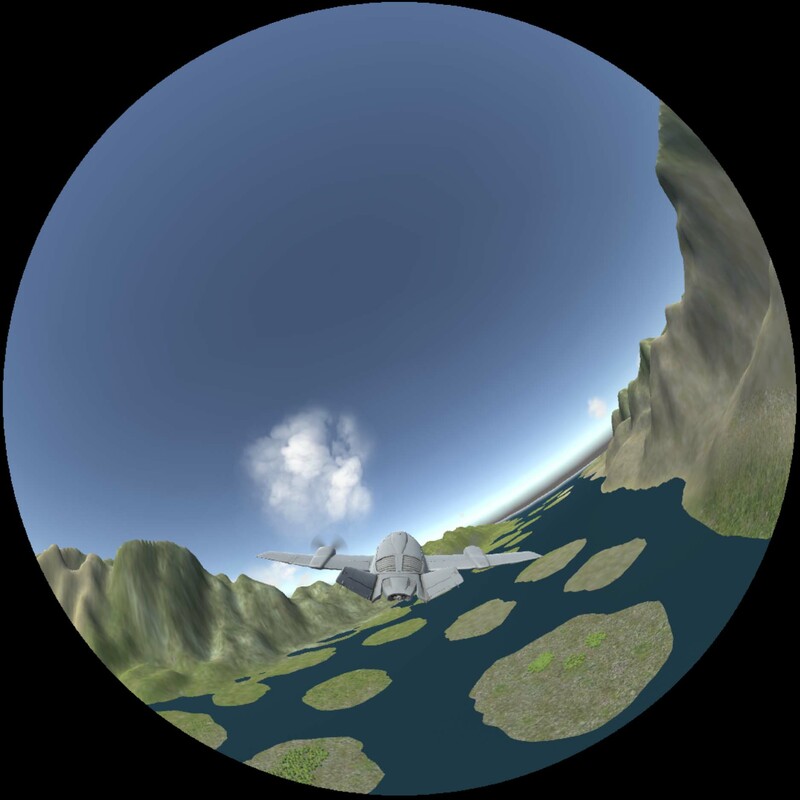 We’re going to be building our fulldome flight simulator game using Unity. I’m using the latest version, which is 2017.1 right now. The ideas that I’m covering are basic game construction techniques. We’re going to learn about importing packages, using assets from complete projects, terrain sculpting, the basic water shader, particle systems, flight vehicles, input setup for joysticks, respawn techniques, collision handling and broadcasting render textures from cameras. I love to code, but I know that’s not how most of us feel about it. This tutorial doesn’t require that know how to code. You’ll also need a copy of DomeMaster tools by Charles Veasey, Spout Framework for Windows, and Spout4Unity, These tools will be used to get your videogame content into the multiple projectors which make up a dome. Start Unity3D, and when it asks what project to open, open the DomeFlyer folder you made, it will warn you about the import version updating, say OK.
Sculpt the terrain and texture it according to your taste, I recommend making some islands. This is where you can really make your game shine. I’ll show you a way to bring real world textures into your game from maps in another tutorial. Change the terrain position to x:0, y: -6 z: 0, this moves the places which are 0 height to slightly underwater. Add some trees. If you do this now, the trees will be generated with the expected clumps. OPTIONAL: Drag the default Main Camera onto the AircraftPropeller Set the transform position to x:0, y:10, z: -20 and the transform rotation x to 20, and the Field Of View to 90, and the Far clipping plane to 10000 Remove the audio source - If you don’t want to add the fulldome display stuff, skip to Configure now, play the game and show all your friends what you made. Tell them to all follow this tutorial and start a game development company of their own. Disable the Main Camera object. Open the 180-Domemaster prefab you added to the scene earlier, it has a FisheyeCamera in it. 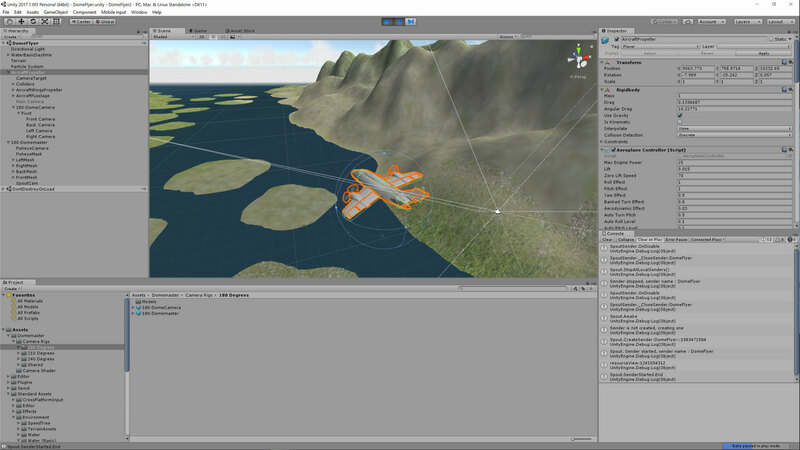 Unity comes with basic joystick controls already configured, and the mouse and keyboard can be used to control the plane. You might want to add the secondary joystick input if you have a dual stick controller like those made by Microsoft for the XBox. Multiple XBox controllers can be added to a Unity game, and they are remote. If you don’t care about joysticks and are going to play with your mouse and keyboard, go on to Configure. Since the 4 Axis controller for flight in Unity uses the Mouse X And Mouse Y for tracking pitch and roll, we’re going to add those to the joystick. In the controls which Unity comes with, the inputs all map to a single player. To build a game where more than one player can run a character, you can add multiple joystick controllers. This is an easy way to build a fun multiplayer game for your dome. Play your new game on a dome using omnidome or vDome for Windows, or project it with a single projector.